Anne Gadwa Nicodemus – Indicators, Metrics and Evaluations, Oh My! Nicodemus co-authored Creative Placemaking, the report for the Mayors’ Institute of City Design (2010) that defined the field. 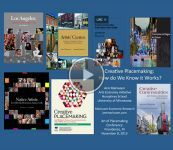 Her journal article “Fuzzy Vibrancy” (Cultural Trends, 2013)and forthcoming book, The Creative Placemakers’ Playbook, look more deeply at creative placemaking as cultural policy and its ethics and practical challenges. Nicodemus has also contributed to the intersection of arts, culture, and community development through other works. Her How Art Spaces Matter reports (for Artspace Projects, 2010 and 2011) reveal the benefits of art spaces to artists’ careers and communities, including anchoring arts districts, expanding arts access, and boosts to safety, livability, tax rolls and property values. Nicodemus and Ann Marksuen’s “Arts and Culture in Urban and Regional Planning: A Review and Research Agenda” (Journal of Planning and Education Research, 2010) was the most downloaded of that journal’s articles in 2009 and 2010. They also recently contributed a chapter to Creative Communities: Art Works in Economic Development (Brookings Institution Press, 2013). Nicodemus’ short writings have also appeared in publications including Grantmakers in the Arts: Reader, Createquity.com and Minnesota Public Radio News. Nicodemus speaks widely on creative placemaking and artist spaces, giving frequent talks at universities and professional conferences nationwide, and as far-flung as Macau, China. She was recognized as one of the nation’s fifty most influential people in the nonprofit arts in 2012 and 2013. Nicodemus holds a Masters of Urban and Regional Planning from the University of Minnesota’s Humphrey School of Public Affairs and a B.A. in dance and biology from Oberlin College. Nicodemus grew up in suburban Connecticut; went to college surrounded by the cornfields of Ohio; and lived, danced, and worked in New York City and Minneapolis for years. Her family hails from central Long Island’s north shore, where she grew up spending summers on one of its last remaining farms. Recently, she’s laid down roots in Pennsylvania’s Lehigh Valley. She lives in Easton, PA with her partner Julia Frances Nicodemus, dog Bogart, and cat Phoebe.